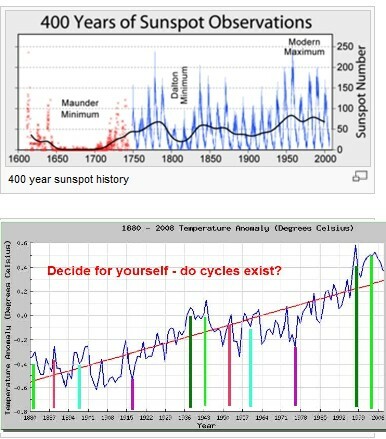 Physics of Climate Change tells us "Why it's not carbon dioxide after all"
Now, at the right are records of sunspot activity for the last 400 years. (Click here for more details on this.) Sunspot activity which has a notable 11 year cycle which NASA says will next peak in 2013. It is affected by forces from the planets causing magnetic phenomena such as faculae and coronal loops. But, as this plot shows, there is another cycle of about 934 years as well as a superimposed 60 year cycle related to the orbits of the sun and nine other planets. As this paper and also this paper postulate, both of these longer cycles are due to gravitational variations. Note that the (inverted) 934 year cycle had a maximum in the Medieval Warming Period around the year 1125 then a minimum in the 17th century "Little Ice Age." The 60 year cycle also peaked around 1999-2000, as we experienced, and the next maximum appears to be about 2059. Decide for yourself whether cycles exist in the plots at the right. 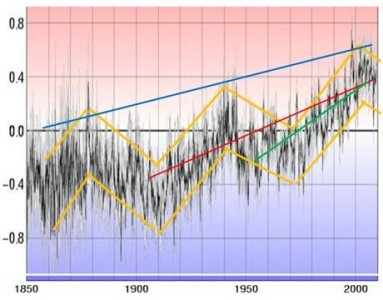 The red line above indicates the long-term trend and there is an increase of less than 0.7 degree F (0.39 degree C) since 1880, or around 0.3 degrees C per century in the U.S. There could also be some exaggeration resulting from urban crawl due to ground stations that were in rural areas being now surrounded by concrete etc, so this might account for some of the rise. For more detail regarding such errors read this article. The article concludes that so-called global warming is not in fact global at all - there is possibly even some cooling in the Southern Hemisphere. The 11 and 60 year cycles, as well as the 934 year cycle rising from the Little Ice Age must be taken into account when attempting to derive average increases. Recent research helped to confirm a maximum in the 934 year cycle in the 12th century. Those temperatures were estimated to have been warmer than current temperatures, despite lack of industrialisation. 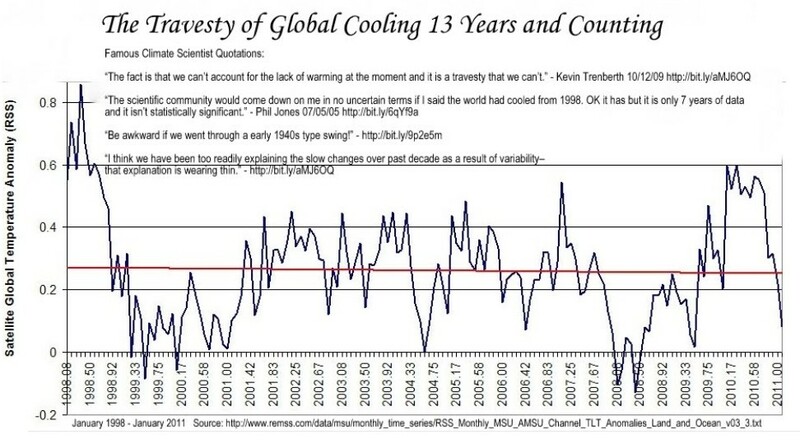 And now the world has been cooling for 13 years. Of interest is the following graph of two cycles which are about 60 years in length. The black lines indicate the cycle from 1883 to 1943 and the red lines that from 1943 to 2003. When shifted by 0.3 degrees C (with the gradient of the second cycle reduced a little) and then overlaid the similarity is remarkable, implying cyclic patterns are significant. 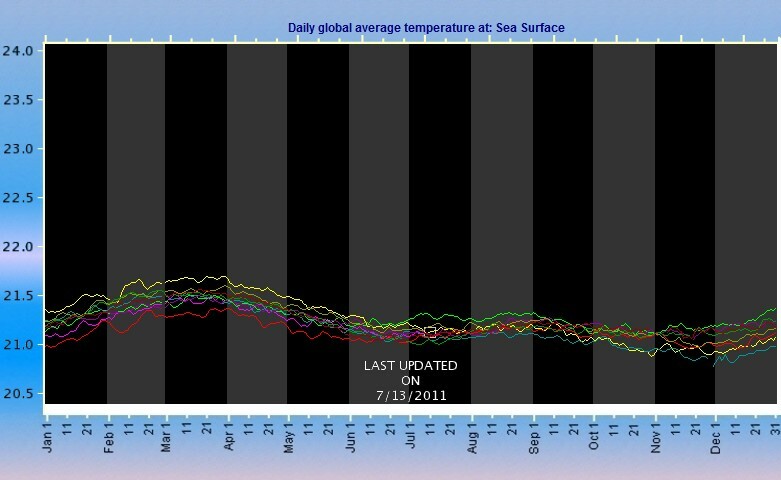 Overlapping patterns eliminate the effect of short-term cycles and similar patterns also appear in ocean temperatures. There does appear to be some additional warming in the second cycle, but the pattern from 2000 to 2011 now indicates that there has been a significant reduction in the gradient of the intra-cycle trend. 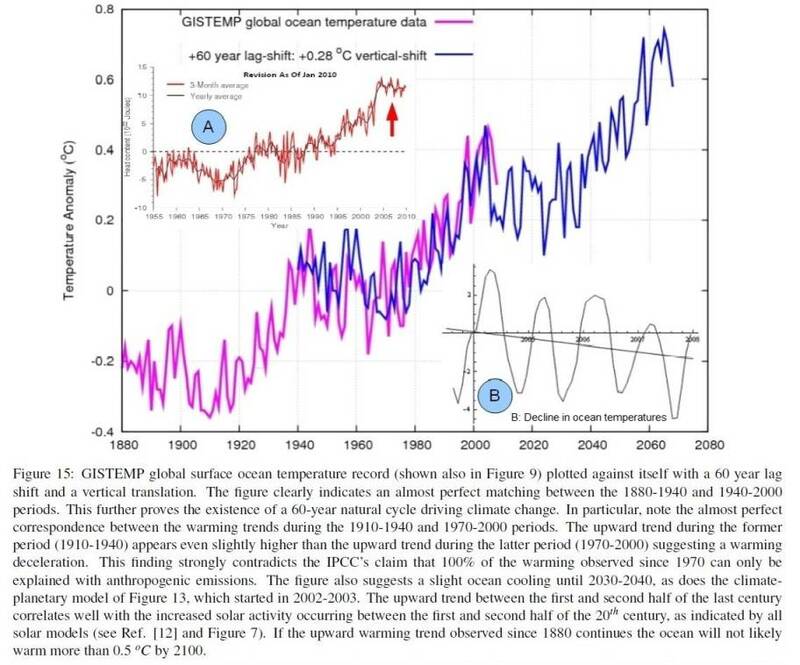 The change in these gradients points to the plausibility that nuclear testing (which ended in the late 1990's) could have been the cause, rather than carbon dioxide. The chart at left shows temperatures and CO₂levels in relation to the vigor of solar wind. The apparent correlation of temperature with CO₂levels is discussed in this paper. More obvious is the correlation between temperature and the vigor of solar wind, this being related to sunspot activity. Read here about possible effects on cloud cover due to solar winds in the heliosphere. Now let me refer you to this paper. Here you will see that satellite (and weather balloon) measurements "do not display much warming at all." But, if greenhouse gases were trapping more heat, it should be detected at high altitudes! The satellite measurements are made with microwaves and can be calculated at any altitude right down to sea level. (p.80) See also this NASA site. In the chart below three independent measures all show the same year-to-year variation and have no warming trend except for the El Niño spike of 1998-99 which has now passed. Click here and select "sea surface" to see data for the last decade. These NASA satellite measurements were to be a stumbling block for those with an opposing agenda, but a scientist by the name of Frank Wentz (p.83 ff) went straight to the U.S. Vice President and convinced him that the measurements were in error. 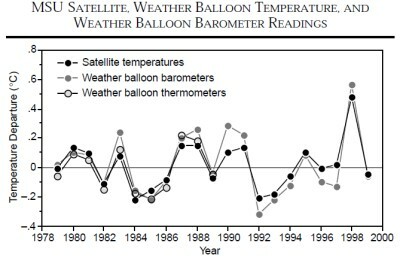 Wentz's logic was later shown to be incorrect and the satellite measurements were in agreement with balloon measurements. But the damage had been done and the truth was concealed from the public and the decision makers. 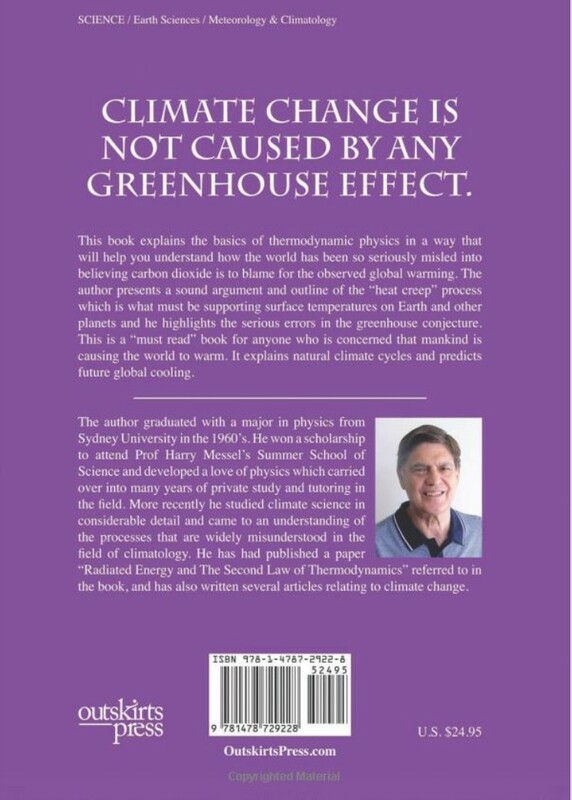 The author concludes: "No warming whatsoever has occurred from 5,000 feet all the way to the top of the troposphere in the last 20 years." (p.90) Yes, there will be variations of a few degrees up and down in the lower 4,000 feet or so of the Earth's atmosphere, but it is highly improbable that an ever-increasing temperature pattern will occur for any reason, and the relatively stable temperatures in the free troposphere (above 5,000 feet) appear to control any accumulation of excessive heat. Furthermore, we can see here that current temperatures are slightly lower than in 2003, and a detailed analysis of the energy balance shows that there is a slightly declining trend from 2003 to the present. Some will say this is just random "noise" below a continuing upward trend. But look closely at the regular intra-annual pattern in each of the eight years represented by different coloured lines in this plot. The pattern is so regular in every year that the probability of this happening at random is infinitesimally small. 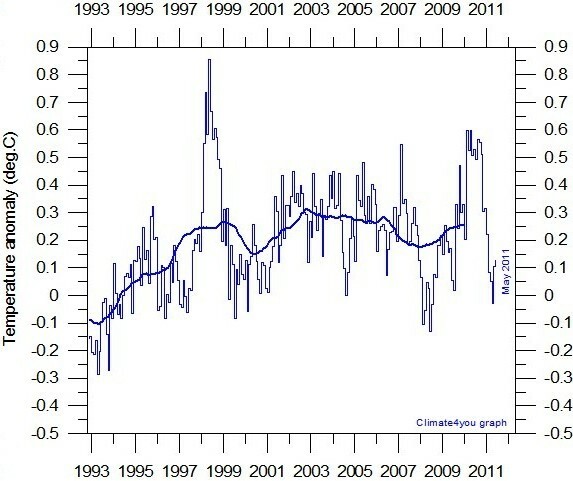 So we can deduce with confidence that temperatures have stopped increasing even though carbon dioxide levels have not. Now this paper states that "Part of the core's heat flow is thought to represent power dissipated by the geo-dynamo that is thought to produce the geomagnetic field" and we know that gravity is involved in this. The liquid core is over 5,400 deg.C and borehole measurements indicate the crust is still about 300 deg.C just 10,000 metres below the surface. And so there is a temperature gradient from the core to the surface as heat flows outwards, mostly by slow conduction. Check some typical data here and note how temperatures usually increase after the first 30 to 80 metres. Further heat must be generated in the Earth's crust when it is deformed by the sun and the moon's gravity. If there were no heat from the core or the sun, everything would be close to absolute zero, which is minus 273.15 degrees C. And so we know that the Earth's crust has been warmed by at least 282 degrees in order to get to its present temperatures which we can observe in cores and underground caves and mines. Even in the absence of the sun the lowest few metres of the atmosphere would warm by about 282 degrees on average (that is, to 9 deg.C) due to the heat coming from the crust as explained below. This is not far off a typical mean temperature in the early hours before sunrise. As the chart shows mean daytime temperatures around 21 deg.C, this leaves only another 12 degrees or so for the sun to contribute, namely about 4% of the total of 294 degrees. The regularity of intra-annual variations in temperatures about a slightly declining trend since 2003 is sufficient proof that the rate of increase in global temperatures has now reduced significantly. A strong correlation between temperatures and the total gravity from sun and planets suggests that solar system orbits regulate global climate cycles. But the underlying trend in these cycles was probably steepened a little due to nuclear testing rather than carbon dioxide levels. For more detail see Science Notes or skip to the SUMMARY below. When the claim is made that the Earth has warmed 0.74 degrees from 1906 – 2005 (IPCC AR4) they are spuriously ignoring the 60-year cycle and arbitrarily choosing a start and end for a linear trend within a non-linear cycle. 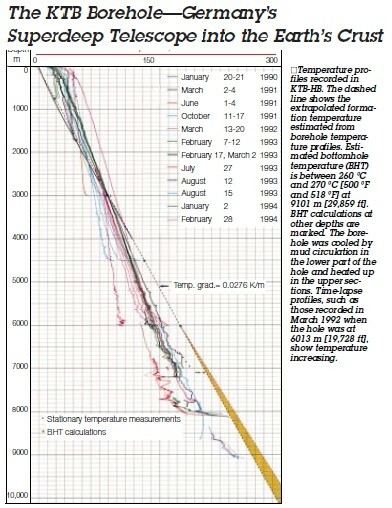 The red line on the figure below shows the 0.74 degrees per century. 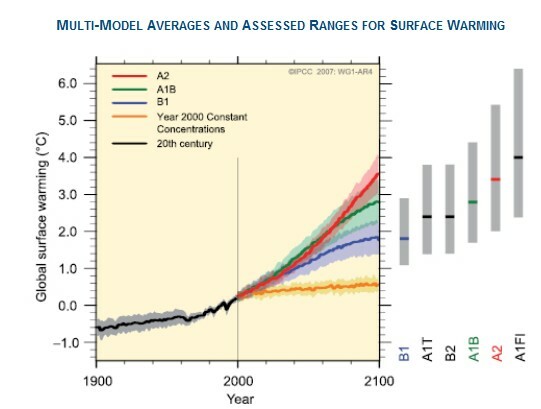 The linear warming trend shown when accounting for the cycle is actually about 0.4 degrees per century as shown by the blue line on the figure below. 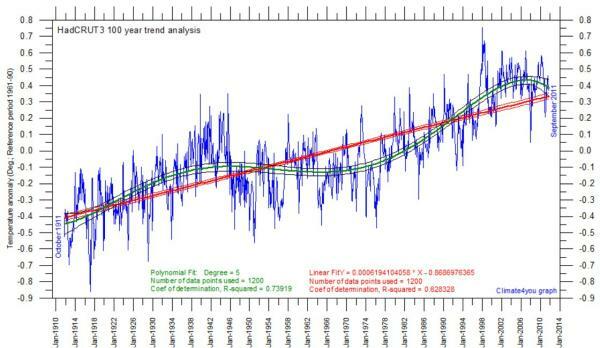 The IPCC* also claims in the same AR4 summary document that “The linear warming trend over the last 50 years (0.13 [0.10 to 0.16]°C per decade) is nearly twice that for the last 100 years.” This is shown by the green line on the figure above. They call this “acceleration” of the warming trend, completely ignoring that a linear trend cannot be calculated arbitrarily in cyclical data. 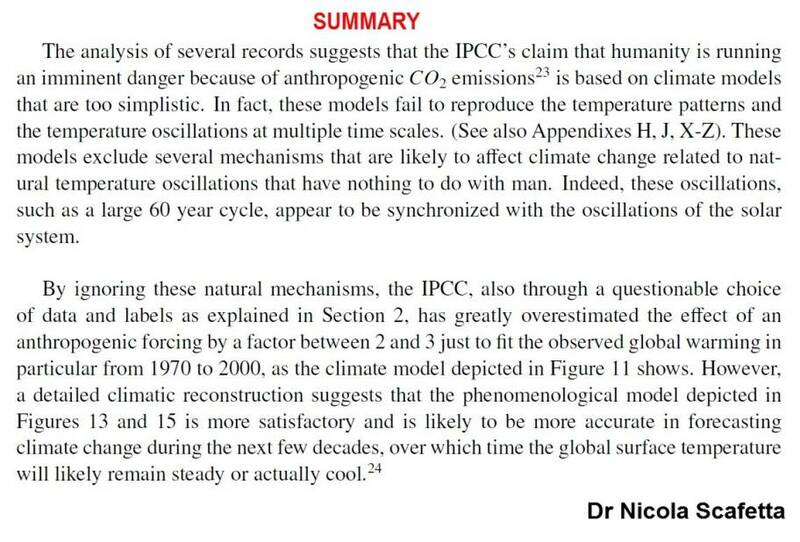 See this summary and this paper showing the inaccuracy of IPCC models. Read this regarding models. 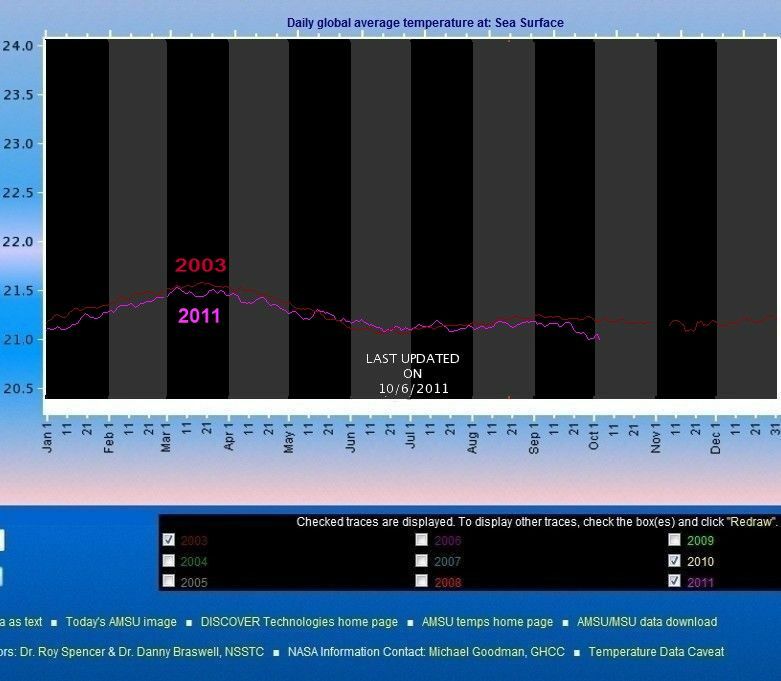 Click here to see satellite temperature measurements at sea level, and note that the mean for the last 12 months is below that for 2003. Click here to read what many scientists are saying about the climate debate. 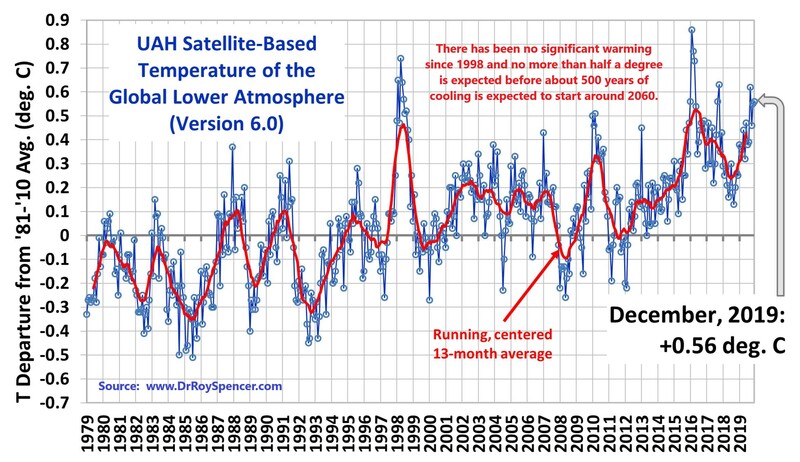 Temperatures since January 2003 have declined below the long term trend due to the 60 year cycle and possibly also a cooling effect from Saturn beginning in the year 2000. There is no evidence that man-made CO2 is having any noticeable effect. 1. 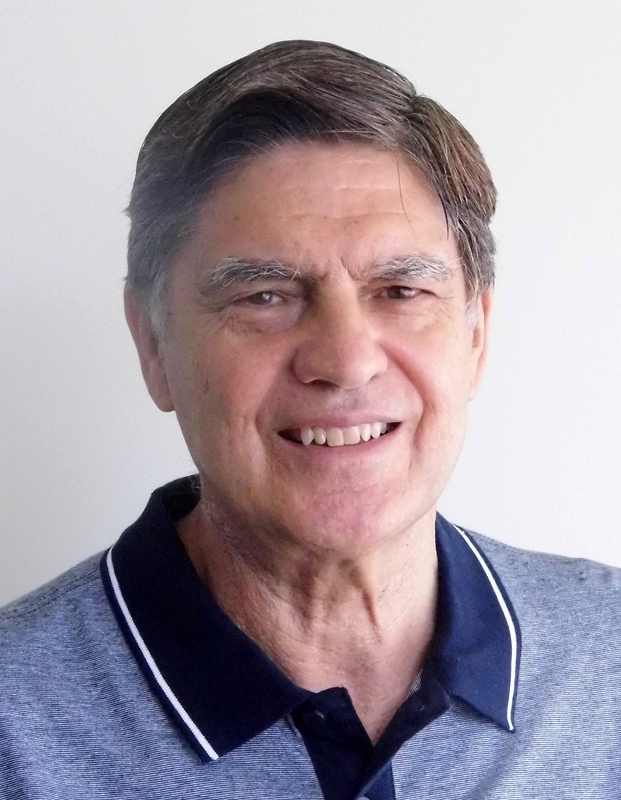 THE 60 YEAR CYLE: Dr Nicola Scafetta and others have observed 60 year and other cycles. Mathematical statistical analysis of the data (using Fourier transforms) confirms its existence. John Dodds explained why it is due to variations in the gravitational energy from planets leading to irregularities in the pattern, and Dr Scafetta also found a correlation with gravitational forces. These irregularities also help to confirm the existence of the cycle because, when several nodes match with a high statistical probability the evidence is very compelling. Furthermore, application of the 60 year cycle predicted the maximum (1999-2000) above the long term 934 year cyclical trend. There should be one more 60-year maximum in about 2059 and then we can expect the long-term trend to decline for about 450 years. 2. THE PLANETS CAUSE THE CYCLES: Why are temperatures on Earth apparently following cyclical patterns that correlate with certain orbital events of the moon and the planets, primarily Jupiter, Venus and Saturn? Consider, firstly, the effect of gravitational energy which the Earth receives from the moon. It pulls ocean waters forming tides and ocean currents. Inside the liquid core it must also cause huge currents and tides as the Earth spins and the moon orbits it. The friction in all this motion generates massive heat. The total energy received from the sun's heat and light is almost insignificant compared with the energy coming from the force of gravity from the moon and sun upon Earth. There is also a gravitational force coming from each of the planets and these forces fluctuate as the distance varies. Now the Earth's distances from the moon and sun do not vary anywhere near as much relatively as its distance from Jupiter in particular. The latter distance varies from about four times the distance of the Earth from the sun to about 6.5 times that distance. So, even though Jupiter is further away, it is much larger than the moon and its relative motion towards and away from the Earth magnifies the effect of changes in the gravitational acceleration which it imparts upon the Earth. Now, when Saturn is pulling in exactly the opposite direction to Jupiter, its gravity will reduce the effect of that from Jupiter. Then, as they continue in their orbits, there will be less of a reduction until, about 15 years later, Saturn will start to pull together with Jupiter, producing the strongest combined effect another 15 years later. Then, about 30 years later, the Earth will again be aligned between Jupiter and Saturn. This complete cycle is currently happening about every 59.6 years causing our "60-year" cycles which are superimposed on the 934 year long term cycle. Sunspots appear to correlate as they may be caused by variations in planetary magnetic fields. It does seem plausible that variations in solar winds cause reactions in the ionosphere which, in turn, could affect cloud cover and thus climate. This is being investigated at present. Another possibility is that gravity from Jupiter and Saturn causes ocean currents that produce the 60 year cycles in the Pacific Decadal Oscillation (PDO) and, as discussed here, there appears to be a correlation between the PDO and cloud cover. Some other possibilites are suggested in Notes 5 to 8 below. 3. 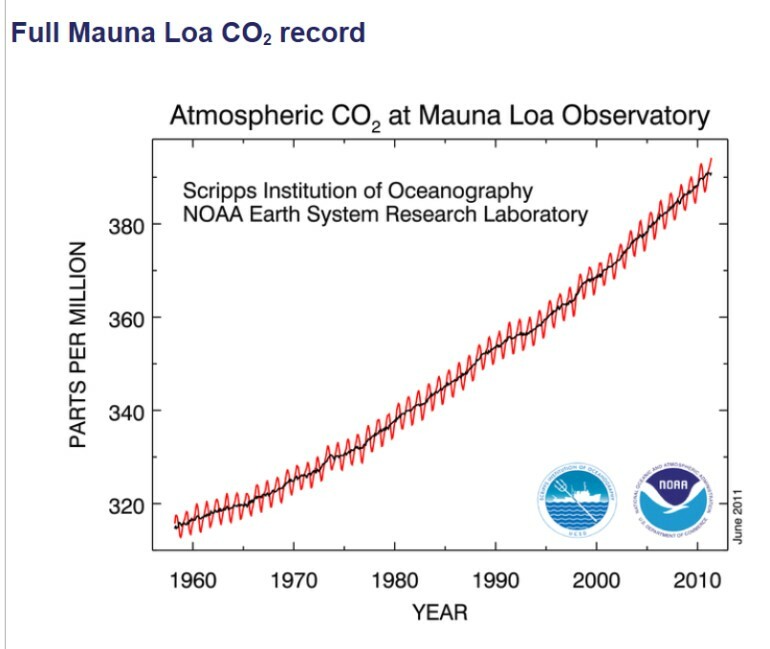 NO EVIDENCE OF EXTRA WARMING DUE TO CO2: Carbon dioxide continues to rise as shown here but temperature movements can be fully explained by the cycles which predicted the level or slightly downward trend we are now seeing here since 2003. The very slight increase in gradient between the two 60-year cycles 1883-1943 and 1943-2003 could very well have been due to the heat generated underground by nuclear testing which ceased in the late 1990's. Such explosions could also affect the conductivity of the nearby crust and thus perhaps increase the surface temperature supported by the core heat flow. 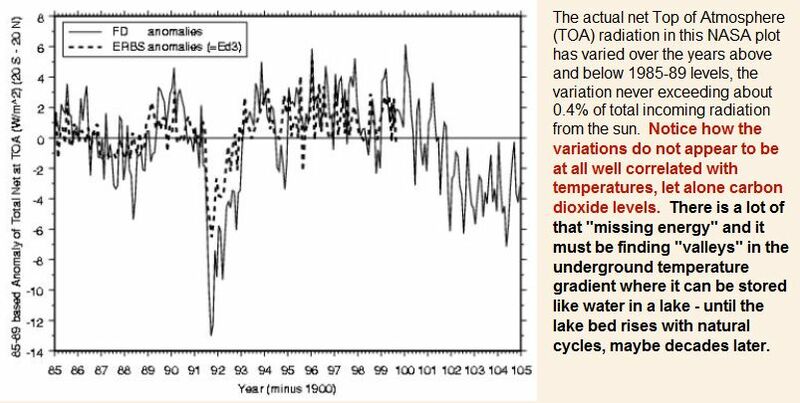 There is absolutely no empirical evidence of any effect on temperatures (or net radiation) that could only have been caused by man-made (anthropogenic) carbon dioxide. 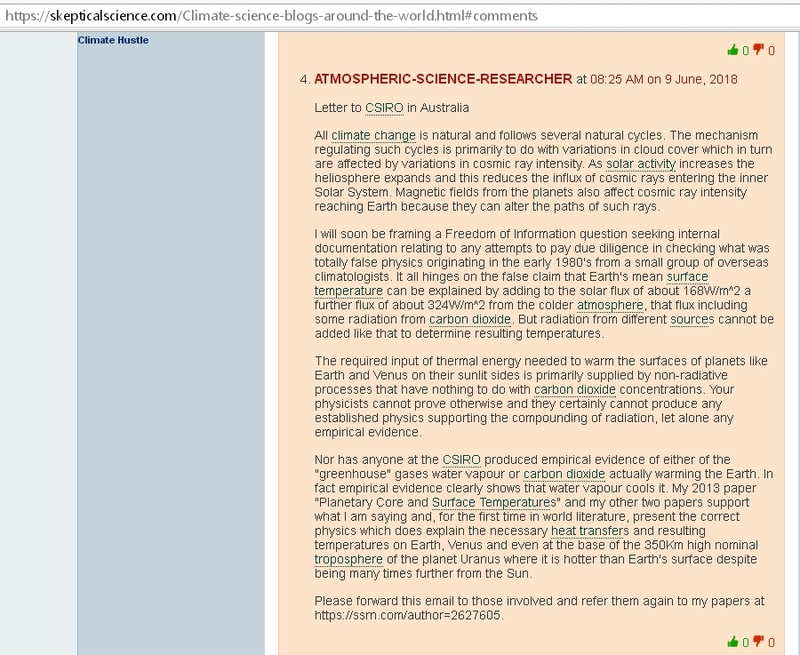 So the Greenhouse Warming Theory has no empirical evidence to back it up. 4. 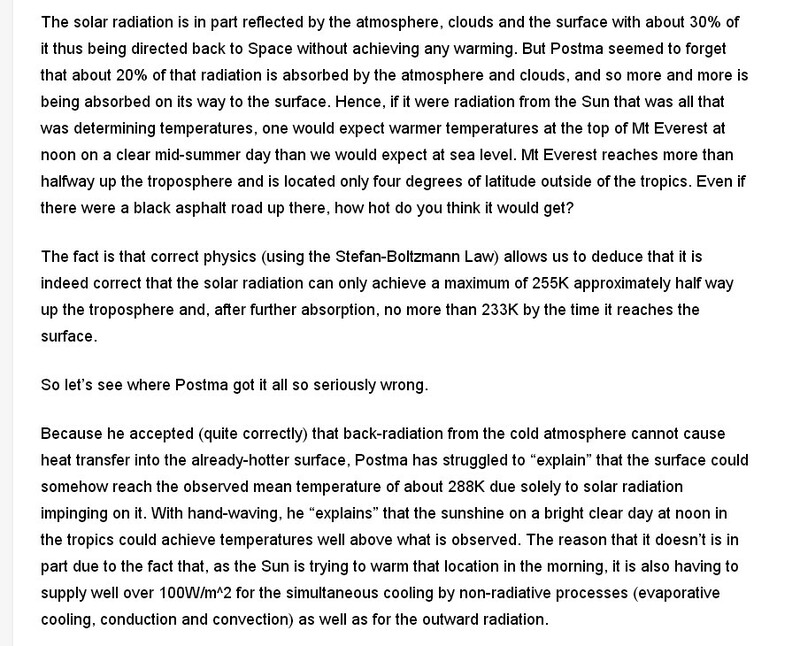 THE GREENHOUSE GAS FALLACY: The GHG theory considers heat (actually electromagnetic radiation) coming from the sun. Some radiation gets through the clouds and heat the earth, or gets reflected. Other radiation from the surface is also sent into the atmosphere. 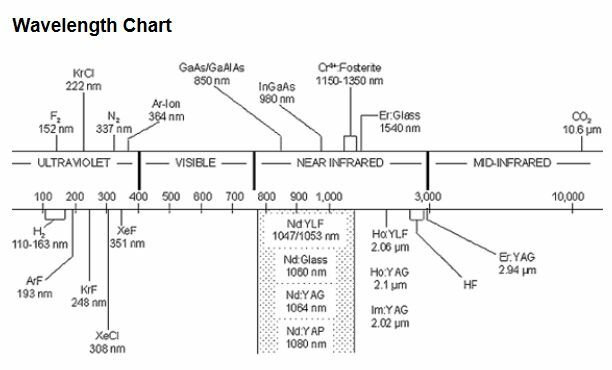 The radiation which goes up from the surface has varying infra-red frequencies and some will encounter CO₂molecules in the atmosphere where carbon dioxide captures only that radiation in a certain frequency range. The width of this range increases with the density of carbon dioxide molecules and so the argument is that, because these frequencies are blocked more heat will be trapped if carbon dioxide levels increase. But the theory does not consider (a) the variations in delayed emission of more radiation from the oceans in particular due to heat being temporarily stored therein, (b) the proportion of the additional heat being transferred by convection, (c) the role played by radiation originating from the thermal energy in the far greater numbers of nitrogen and oxygen molecules, (d) the relative proportions of heating actually caused by solar insolation compared with that caused by heat flow from the core and crust and (e) the "dam effect" upon core heat flow resulting from extra stored heat. Please also read Science Note 10 below. 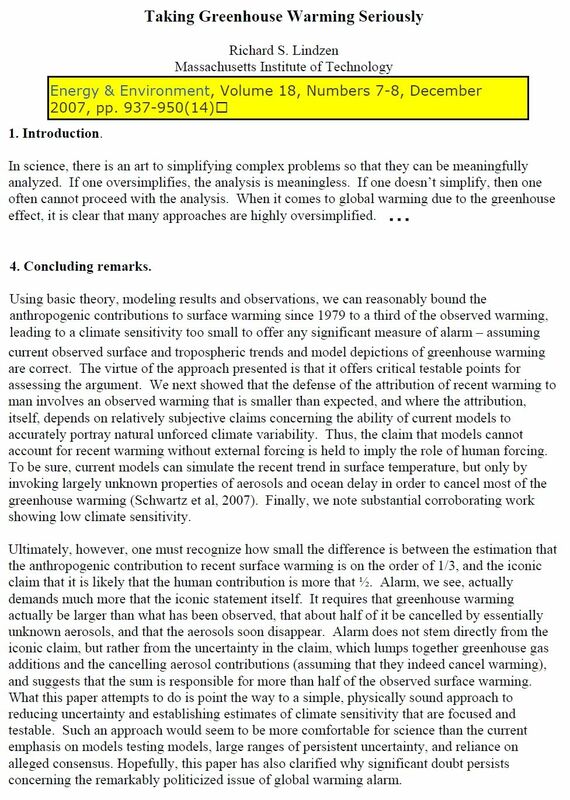 If you do not accept this, then read this paper which explains how the basic Greenhouse model has been grossly oversimplified because so much thermal energy rises by convection or gets swept up by winds which take it to higher levels where it escapes to space. Note that Professor Lindzen concludes that there is no cause for alarm. In summary - "warm air" (actually well below freezing point) cannot be "trapped" in the upper atmosphere, let alone return by convection to the surface level. So that leaves only the possibility that solar insolation might somehow permanently warm the oceans (and to a smaller extent the continental crust) in some way that leads to a cumulative effect producing ever-increasing temperatures. No more than half the radiation heading upwards can be returned to earth, but even then it does not cause warming Because of the cooling periods at night and in winter, any permanent retention of heat (over and above the crustal temperatures maintained by core heat) would in fact be contrary to the laws of Physics, because any delay of heat transfer to space in the upper atmosphere cannot cause a steeper temperature gradient in the lower (near surface) atmosphere, and thus cannot affect the normal equilibrium state at the crust/atmosphere interface. Also see the second page. 5. PLANETARY ORBITS AND CLIMATE FORECASTS: The Earth is subject to gravitational forces from the sun and moon, and also, to a much lesser extent, from the other planets. Of these planets, Jupiter, Saturn and Venus exert the most force and this is the main reason that the Earth's orbit varies in its distance from the sun from 147.3 to 152.1 million kilometres. For a planet (or a satellite) to remain in orbit its absolute speed and distance must be such that the gravitational force is just sufficient to keep it accelerating (that is, changing direction) by the right amount to follow its (roughly) circular path. 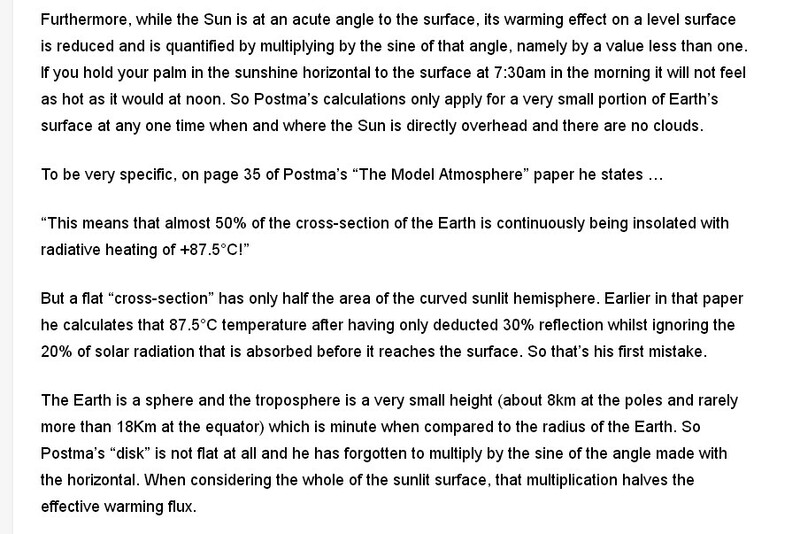 Hence the gravitational force of the Sun is "used up" in maintaining the Earth's orbit. But you may be surprised to learn that the acceleration due to the Moon's gravity is more than double that of the Sun. That is why it is the Moon that has most influence on the tides. 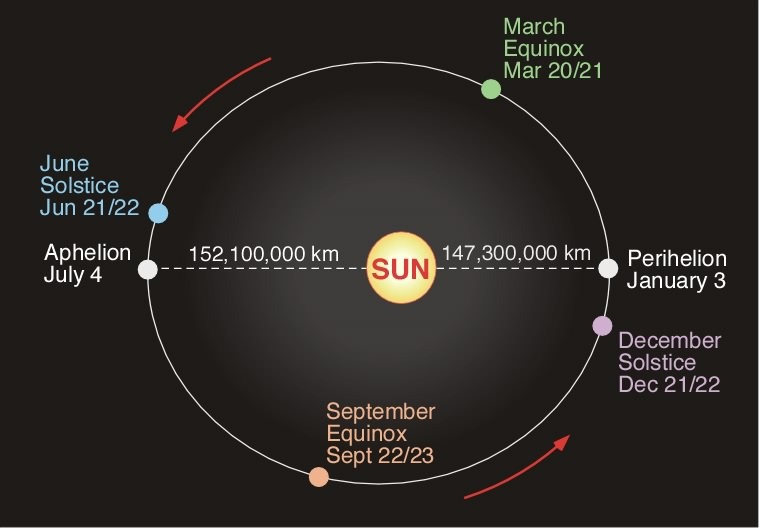 The Earth is spinning and has an atmosphere held by its own gravity, but drawn out a little each day by gravity from the moon and (by about 46% as much) the sun. There is also energy being generated for the Earth's magnetic field that will be discussed in Science Note 7. But most importantly, the total force of gravity varies a little as the distances of the planets varies. The effect is most noticeable for Jupiter, Venus and Saturn. It is the orbits of these planets that seem to correlate with the cycles in world temperatures, and we can postulate that the cause must be variations in the gravitational force coming from these planets, and so we have statistically significant proof from the data that this must be the case. Hence, if man-made additions to the atmosphere or other changes to the environment have no significant effect, we can expect future temperature patterns to continue following the cycles. Consequently, we can expect a slight cooling (more so from 2014) until about 2028 and then warming (less than 0.5 degree) from about 2029 to 2059. The long term trend will then decline towards another "Little Ice Age" about 450 years later. 6. GRAVITY ACTING THROUGH TIDES AND CURRENTS: Now, gravity from the moon (and the sun) acts directly on molecules in the atmosphere and the Earth's crust imparting Kinetic Energy which raises the temperature and creates tides in the atmosphere. As the annual mean gravitational force from the Moon and Sun does not vary much the heat it adds may be thought of as contributing (along with other sources) towards the maintaining of fairly uniform mean temperatures on an annual basis. But the gravity from the closest major planets does vary considerably and this variation appears to be sufficient to cause significant temperature variations over the length of the above cycles. Nothing else could, and nothing else correlates with the cycles. 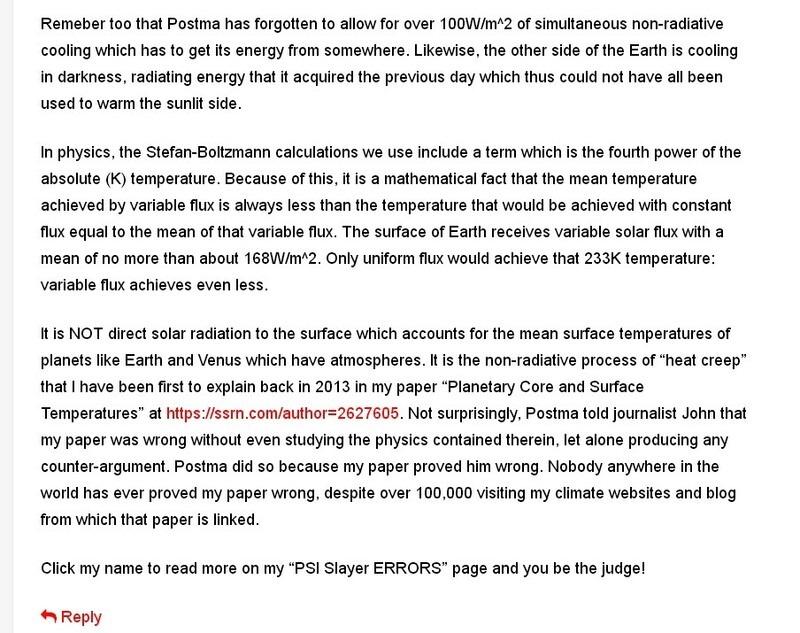 What has not been acknowledged by the IPCC is that the solar insolation only provides about 4% of the total heat required, the rest coming from various sources including fission, the decaying of radioactive isotopes and energy derived from the force of gravity from the sun, moon and planets. Gravitational Potential Energy can be converted at molecular and atomic levels to electromagnetic energy, kinetic energy (heat) and magnetic energy. We must consider all forms of energy, remembering that temperature measurements do not reflect the total energy. The mean surface temperature of the Earth has had to be raised from 0 deg.K (absolute zero which is -273.15 deg.C) to about 294 deg.K. The energy from heat generated in the core does about 96% of the work (282 degrees) and the solar insolation just adds about 12 degrees on average. Much of the gravitational energy is generated by compression and friction below the surface and makes its way to the crust as conducted, convected or radiated heat from the solid core in the centre of the Earth and the liquid core that surrounds it. This heat may have taken millions of years to get through, but it helps to maintain temperatures in the crust at about 9 deg.C as we can observe in deep mines. Gravity also directly affects every molecule above and below the surface imparting Kinetic Energy which can be reflected in temperature measurements. This paper by Prof. R.S. 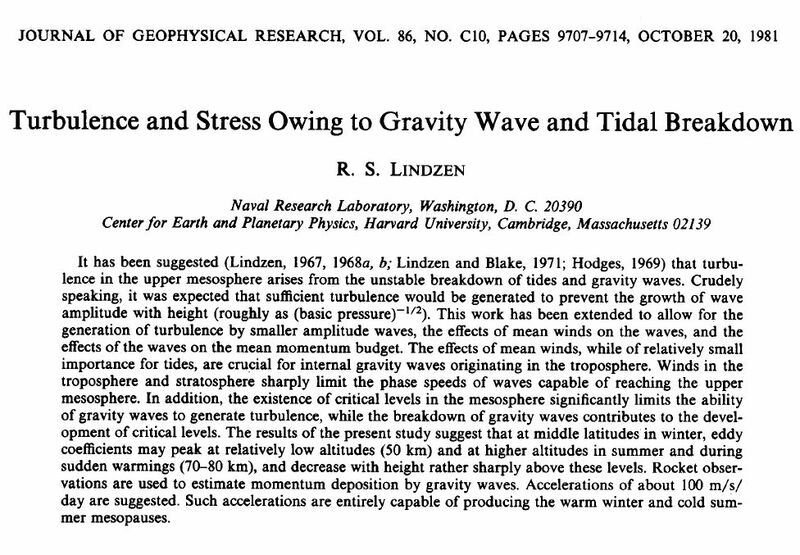 Lindzen talks about warming due to atmospheric waves which are caused by gravity, and that may be a key mechanism linking gravity with temperatures. In addition to this atmospheric warming, massive frictional heat is generated as the Earth's crust is distorted by about 30cm by gravity from the Sun, Moon and planets. It is understandable that the amount of heat will vary as the total gravitational force varies. Just try to imagine the amount of potential energy involved when a significant percentage of the Earth's crust is "lifted" by up to 30cm. Some heat will be generated by friction in the lifting process, and probably much more when it is "dropped" and most of that potential energy goes into heat. But Jupiter's gravity will cause small variations in the total warming. For example, it is mostly Jupiter's gravity which causes the current variation of over 3% in the distance of the Earth from the sun. (This is due partly to the variation in distance between Jupiter and Earth, and partly due to the relative motion when they are approaching or moving away from each other, and there is a cumulative effect each annual orbit.) But, as well as the tides in the crust, gravity variations from the planets may well be causing variations in the Pacific Decadal Oscillation (PDO) which is known to have cyclic behaviour. Dr Spencer has documented correlations between PDO and cloud cover, and thus demonstrated that variations in the PDO could account for about three quarters of the observed variations in climate.. See also Fred Bailey's and John Dodds' books and note Dodds' correlations with El Niño, hurricanes and various ocean and weather events. Gravity from the sun and moon also causes earthquakes which are being predicted very accurately at this site..
7. GRAVITY ACTING THROUGH THE MAGNETIC FIELD: Other energy is transmitted instantly by magnetic fields generated in the liquid core by rotating ions in a gravitational field. These fields vary a little as the input of gravity varies (due to planetary orbits) and so this leads to variations in the magnetic energy which is transferred from the magnetic field to charged particles in the stratosphere, explaining the current cooling observed there. 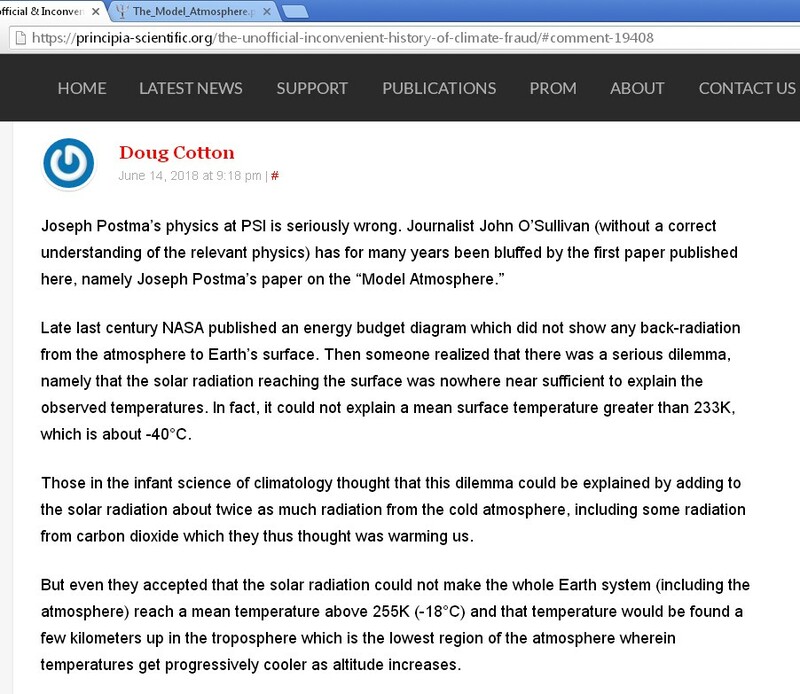 Thus such cooling does not prove that heat is being "trapped" by the Greenhouse Effect in the lower troposphere. But what is probably the most direct cause of heat could come from the kinetic energy imparted by this varying magnetic field on charged ions just below the surface - see this website and this paper about a connection between gravity and magnetism. These high energy ions would generate heat as they collide with nearby molecules and such heat would find its way to the surface reasonably quickly, explaining the correlation of the cycles with gravity. 8. SUNSPOTS AND SOLAR WINDS: There is also speculation that the variation in sunspots and solar winds could cause some temperature variations on Earth because of varying amounts of cosmic rays reaching the planet. (Note this video on the CLOUD experiment and this paper.) 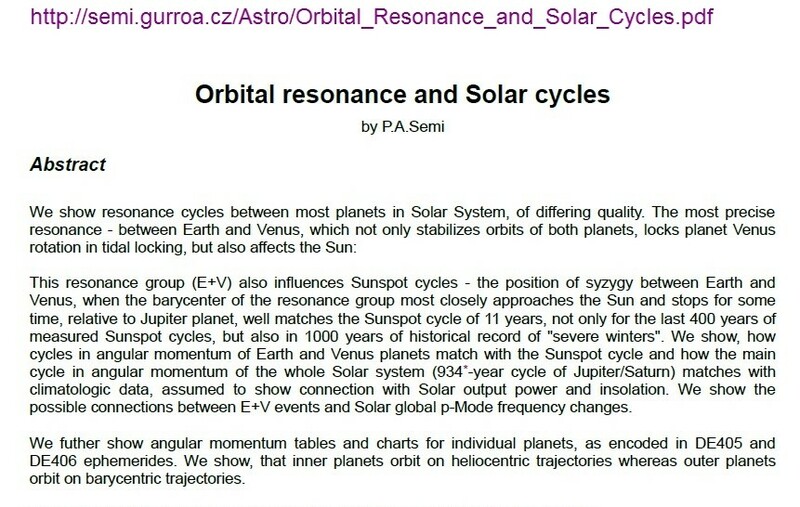 The main thing to note is that solar activity may itself be related to forces from the planets. At this stage there does not appear to be any statistically significant correlation with climate. The "debate" over whether or not carbon dioxide can actually cause global warming comes down to an argument between Climatologists (well versed in forecasting the local weather) and Physicists well versed in what actually happens at the molecular level. Having majored in Physics, and done further extensive study in both climatology and physics, I will summarise the physics involved. Visit my new site, then read about this experiment and this review. There's been only 0.05 degree of warming in 20 years. 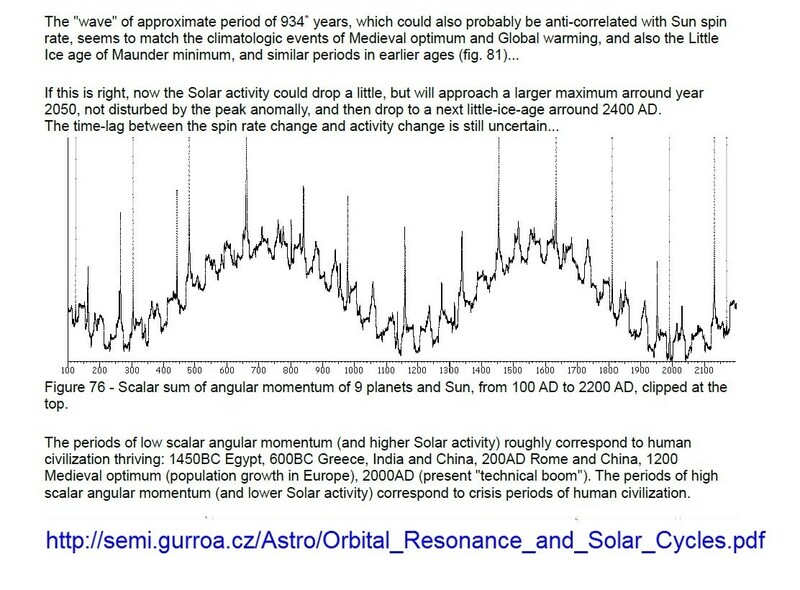 Natural climate cycles (regulated by the Sun and planetary orbits - see my 2019 video for details) indicate 500 years of cooling starting later this century. Climatologists think that air molecules (which are mostly nitrogen and oxygen) collide with molecules at the surface of the Earth's crust (or on top of the ocean) and gain heat (extra kinetic energy) by conduction. They think that these molecules always rise by convection making space for cooler molecules to collide with the surface and repeat the process until equilibrium is achieved. 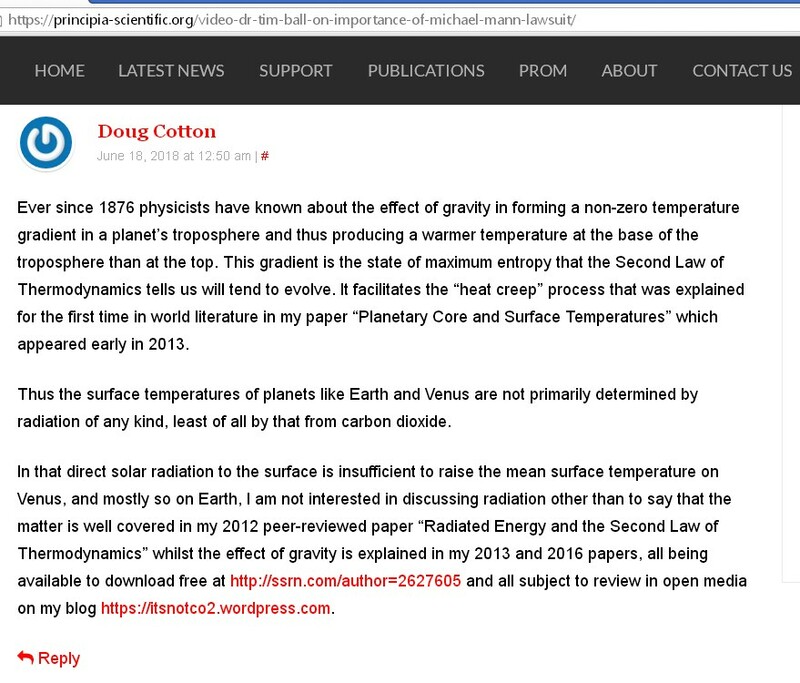 They think that most of the warming of the lower atmosphere from absolute zero (which is minus 273.15 degrees C) has taken place this way since the formation of the Earth, but we find that the Sun's radiation is not strong enough to bring about this process all over the sunlit hemisphere. During the day the Sun radiates light and heat in the form of electromagnetic radiation. We can think of the Sun's radiation (or insolation) as a stream of radiation which contains energy that sometimes can be converted to heat when it strikes the Earth's surface, but not always in all locations. The solar radiation is not sufficient to explain the mean surface temperature and this is not the only way that the Earth's surface gets warmed. 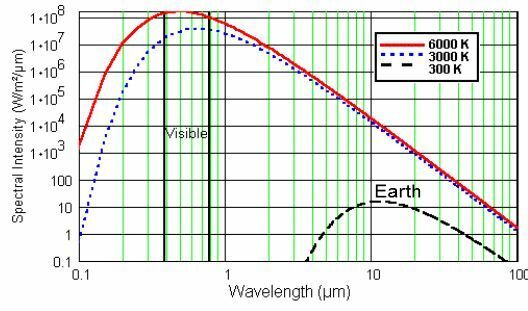 We also need to understand that the Earth radiates some energy itself, but being only about 300 deg.K its radiation has frequencies and wavelengths in the infrared range as shown here. Carbon dioxide molecules can "capture" some of this radiation, with particular wavelengths, and get warmer. But the CO2 molecules then emit more radiation in any direction) and cool off again to some extent. 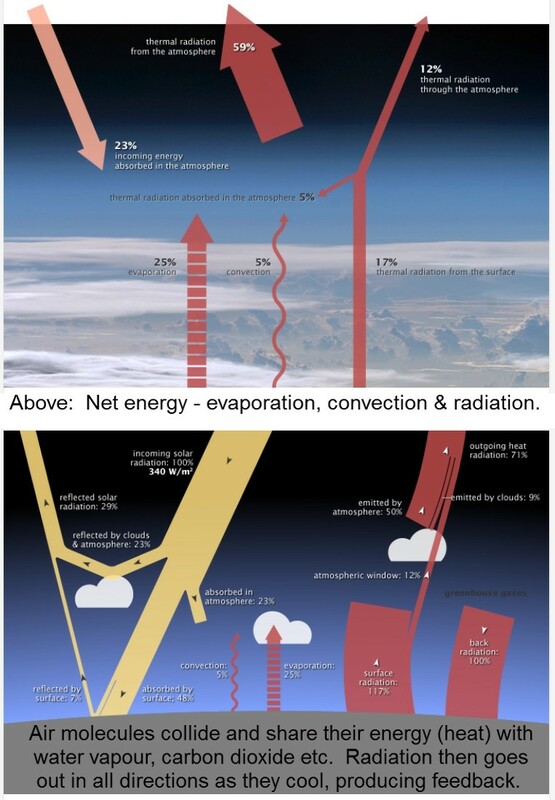 The models (such as demonstrated in these diagrams from NASA) incorrectly add together solar radiation and atmospheric radiation, implying that it is the atmospheric radiation which supposedly helps the Sun to achieve the observed mean surface temperatures. But that is not the case. 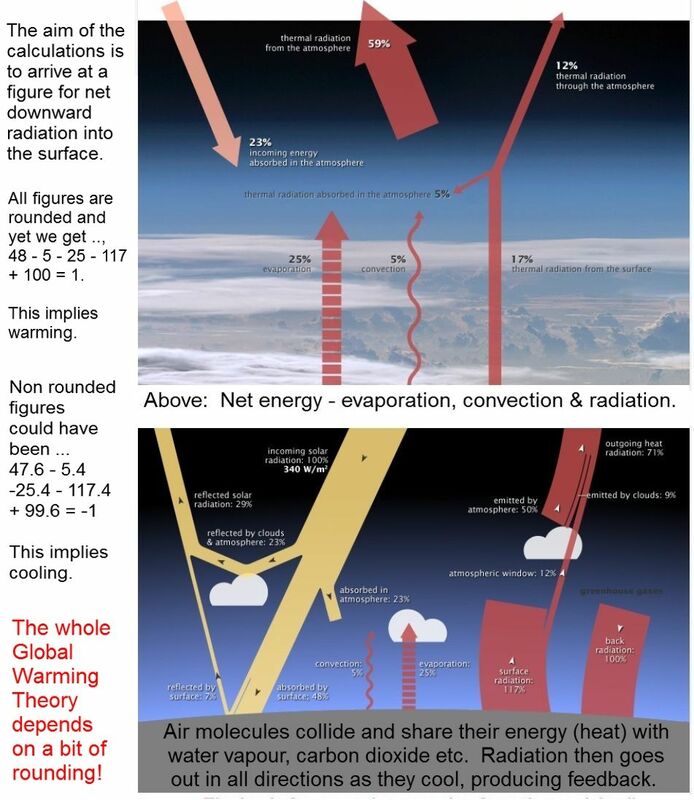 Contrary to what is claimed, radiation from the atmosphere back to the surface does not warm the surface, as is explained by Professor Claes Johnson here. This is a critical flaw in all the standard explanations of the assumed atmospheric greenhouse effect. Such an effect is a physical impossibility. However, air is mostly nitrogen and oxygen air molecules and the number of these molecules is about 2,500 times the number of carbon dioxide molecules. But oxygen molecules, for example, only emit a small amount of radiation themselves. In a sense they need help from carbon dioxide and other greenhouse gases to shed their heat energy for them. When they collide, heat is transferred to the greenhouse gases and the air molecules cool off. So carbon dioxide can actually play a part in helping to cool the air by radiating energy it obtained from other air molecules. The returning radiation has lower energy than that being emitted from the surface. The radiation coming out of the surface in a sense overwhelms the "back radiation" trying to get in, rather like a fire hose directed at a garden hose. It is only the high energy direct sunlight which can actually warm the land surfaces and oceans. If carbon dioxide has any effect it would be in fact a cooling effect. This happens because it absorbs some of the incoming solar radiation which is in the infra-red band, and thus reduces the warming effect of the Sun. But more importantly, it helps energy get radiated out of the atmosphere "leap-frogging" at the speed of light but always from warmer to cooler molecules which are usually at higher altitudes, at least in the troposphere. Whatever carbon dioxide does, water vapour does far more so, because there are many times as many water vapour molecules than there are carbon dioxide molecules in Earth's atmosphere. 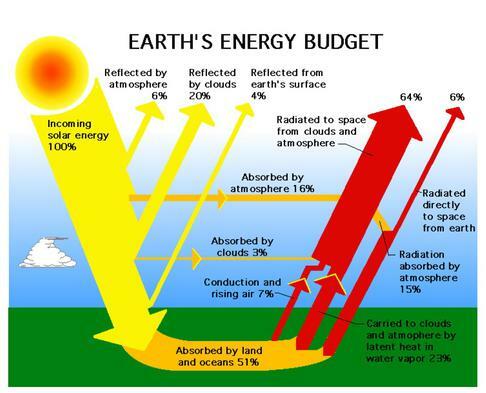 Those who believe in a greenhouse effect need to come to grips with this. If carbon dioxide were raising the surface temperatures, then so too would water vapour. But this is not what is observed. A study which I will soon publish has shown beyond reasonable doubt that regions with higher average water vapour content in the atmosphere above them have lower mean daily maximum and minimum temperatures than do drier regions that are similar in other respects. Engineers have known about the "leap froging" effect of radiating molecules as they help heat transfers across gaps such as those between double glazed windows. They make sure the air is as dry as possible, and they sometimes use non-radiating argon to improve insulation even more than dry air. If little or no radiation exists to help the energy get across the gap, then the process is much slower as the heat transfers by diffusion involving molecular collisions. You can observe the difference in speed in a simple experiment. Just block the radiated heat striking your face from an electric radiator and you will feel an immediate change because radiation travels at the speed of light. In contrast, turn on an oil filled convection heater on one side of a room and see how long it takes before the opposite side of the room gets warmer due to the non-radiative processes of convection and diffusion. There is a direct analogy between the gap between the double glazing and the "gap" which is our atmosphere. Just remember that only that radiation which is travelling from warmer regions to cooler ones is actually transferring heat. Scientists tell us that radiation going from cooler to warmer regions is "pseudo scattered" and does not transfer any thermal energy to the warmer target. It will slow down that portion of cooling which is due to radiation, but has no effect on the rate of non-radiative cooling. In fact, in the case of Earth;s surface, that rate may increase to compensate. You can read more on all this in my paper "Radiated Energy and the Second Law of Thermodynamics" published in March 2012. In 2014 I will be publishing a book that will explain the mechanism (involving gravity) which determines all planetary temperatures. It may help to imagine the atmosphere as an ocean containing heat energy represented by the water. The water flows into a lake which represents the very outer surface of the Earth's crust and the first few metres of the atmosphere in which we live. In the background is a mountain range (deeper inside the Earth) with creeks leading down to the lake. The height of the mountains and the height of the surface of the water represent temperatures in the crust and atmosphere. When the ocean reaches high tide (during the day) the level of the lake also rises, even more so with king tides representing summer. But at low tide (night) the water level of the lake (temperature) falls as water (heat) flows back out into the ocean (atmosphere) and thence to space. Because of the height (temperature) of the mountains, water from the ocean and the lake will never flow back up the creeks to the top of the mountains. The average amount of water stored in the lake will not vary over the years. In the experiment at the right I wish to determine if the heat from the hot polished silver lamp cover can be transferred to the adjacent air molecules by the collision process called diffusion (similar to conduction) which Wikipedia says happens between solids and gases. The emissivity of silver is very low so we do not expect much radiation and, indeed, the fingers on my left hand do not feel any warmth. 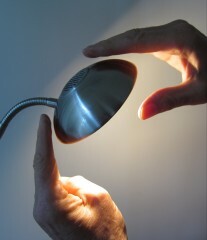 But the fingers above the lamp do feel considerable warmth. This means that the heat is being transferred to air molecules by diffusion and then the warm air molecules are rising straight upwards by convection. Thus they escape between the surface and the fingers of my left hand, but they hit and warm my right hand fingers. Now, consider a carbon dioxide molecule that is warmed by capturing radiation. The assumption has been that this somehow "traps" heat (like an insulating medium) and this heat gets back to Earth. But heat cannot be transferred back to Earth by radiation as that would be like water flowing up a hill. So there is no warming effect in the oceans or land surfaces when some of this "back radiation" travels back down in the direction of Earth. 9. THE CARBON CYCLE: For those who may still be concerned about increasing carbon dioxide, it is important to understand that there is a natural cycle which reduces the level of carbon dioxide when the temperatures get warmer. By a process called photosynthesis, carbon dioxide reacts with water and sunlight to form carbonic acid and oxygen. Carbon dioxide also dissolves in the waters of the oceans, lakes and rivers up to a point where it is in equilibrium with that in the atmosphere. Some of the carbon dioxide in the water then converts to carbonic acid which is instrumental in weathering processes in rocks etc. This weathering yields bicarbonate ions (and other ions) and these end up in limestone beds on the ocean floor. Now the process of weathering is enhanced by warmer temperatures and the additional acidity due to greater photosynthesis. But, by LeChatelier's Principle, equilibrium will be maintained by more carbon dioxide being dissolved out of the atmosphere to provide more carbonic acid. Now listen to this podcast explaining how anthropogenic carbon dioxide is swamped by natural levels which depend on temperature. See also this post on Watts up with that. 10. WHERE THE "SCIENCE" GOES WRONG: This is a link to a typical paper which may well be misleading. He quite correctly explains how carbon dioxide molecules absorb energy from radiation while they delay it, before releasing it with an equivalent drop in energy. And he explains (in keeping with what I have written) that most heat transfer in the troposphere takes place by convection rather than radiation. He says the reactions with carbon dioxide are mostly confined to the stratosphere where it actually gets a bit warmer than the top of the troposphere. The reactions need this heat, he says. But by then the air is very thin and the pressure is less than 10% that at ground level - and of course convection has carried the heat right through the vast bulk of the carbon dioxide in the troposphere. Surely similar captures can happen at similar temperatures in the troposphere. What I suggest happens has been explained in bold in the main text above. He appears to overlook these other mechanisms. Furthermore, he then draws an analogy with a furnace warming an insulated room. But this is not a valid analogy, because there is a temperature gradient in the troposphere and heat will not go back to Earth by convection in a way similar to heat spreading uniformly around a room. Yes it is true that about half the radiation that is captured by carbon dioxide will come back in the direction of Earth, but it will not warm the surface. CO₂molecules can actually help through collisions with the other air molecules from which they gain energy and emit photons "collected" from these. And so carbon dioxide can be a "helper" as well, cooling some molecules and collecting heat from others. So called "Greenhouse" gases can temporarily capture certain photons and send them off in a different direction. CO₂molecules will capture some of the radiation that was initially radiated by the surface itself, and also emit radiation from energy received in collisions with air molecules that were warmed by contact with the surface. 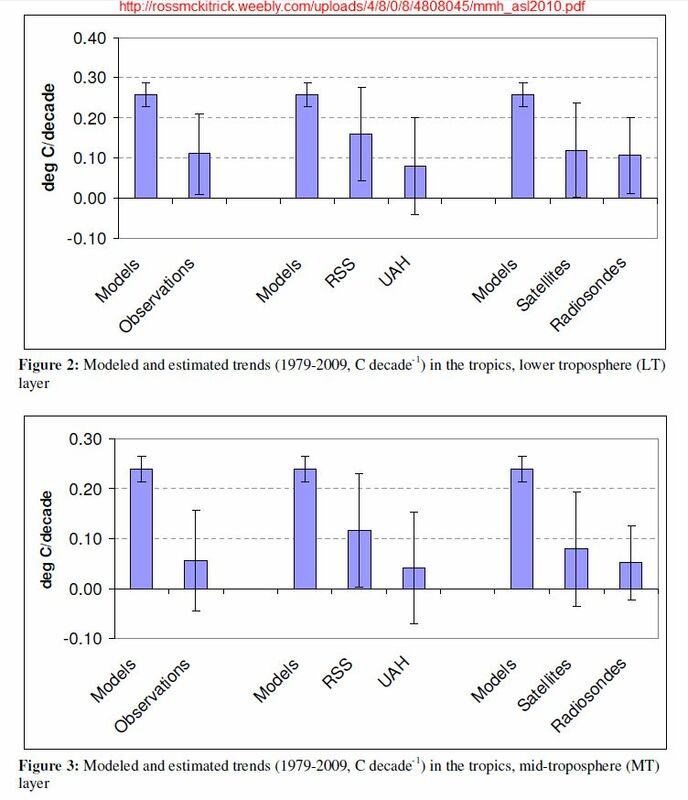 The models used by the IPCC greatly overestimate the radiation from the surface and underestimate the conduction and convection process. The latter process is the main one which ensures that the air which is very close to the surface is kept at about the same temperature as the surface, at least in calm conditions. Radiation from the surface would only predominate if there were no atmosphere. If it were dominating, then the lower atmosphere would get very much colder at night. Laboratory experiments do not simulate the real atmosphere for we know that, because the pressure varies, the Second Law of Thermodynamics is not applicable, being as it is only an approximation in a relatively small isolated physical system. See the second page. In considering whether heat can build up from year to year anywhere in the Earth system we could look at three broad possibilities: (a) the mid and upper atmosphere (b) the continental crust (c) the oceans. Now, even if greenhouse gases do get warm due to capture of photons, then the surrounding air molecules would have to come into equilibrium and, if this leads to some warmer air, it will merely rise and cool in the process, emitting some radiation out of the atmosphere. It will certainly not hang around as warmer air from one year to the next, or return to Earth by convection. The continental crust and the oceans will be warmed during the day only by high frequency (high energy) radiation from direct sunlight. The only contribution that all the carbon dioxide molecules can make is a very small amount of cooling due to their role in capturing incoming infra-red radiation from the Sun and also acting as "conduit" channelling out to space some of the thermal energy they collect by colliding with oxygen and nitrogen molecules. Now, when direct heat from the sun enters a rock surface (say) it will be conducted inwards at a certain rate while ever the above ground temperature is hotter, and it will return outwards when it is cooler at night for example, or during cloudy periods. As there are on average fewer than 12 hours of direct sunlight each day, there is plenty of time for the heat to get back out, and even if some does accumulate in hot spells in summer, it has all winter to cool off. The process is similar in the oceans, but they can retain much more heat and, in any one place, will usually be warmer in summer than in winter. So, over the course of a year, the heat from solar insolation is, in effect, only temporary. It is the heat flow from the core of the Earth that maintains a "base" temperature simply because the underground conduction rate is far slower than the rate of convection for warm air rising in the atmosphere. Life as we know it would not exist on this planet if the temperature gradient caused by the heat flowing from the core were such that the mean "break out" temperature at the surface were not something like 9 deg.C give or take a few degrees. The German borehole data is likely to be fairly typical of such "break out" temperatures at similar latitudes, north or south. These break out temperatures vary from about 25 deg.C at the Equator to below freezing point at the poles, probably because of varying amounts of friction in the spinning liquid core. Of course solar insolation also varies, adding to the contrast between the equator and the poles. Long and short term cycles can be observed in the temperature records and also in the calculated scalar angular momentum of the sun and nine planets, this plot (when inverted) exhibiting 934 year and 60 year cycles that correlate well with observed temperatures. It is postulated that the acceleration due to gravity resulting from the relative motion associated with this angular momentum (together with some from direct attraction) will add to or subtract from the gravitational acceleration due to the moon, which causes tides in the oceans, the atmosphere and the solid outer crust, as well as friction in the liquid core. Variations in friction due to crustal tides could explain the above cycles, whilst longer-term variations affecting the liquid core could explain cycles of ice age proportions. I believe the above discussion should cast serious doubt upon the IPCC projections and the supposed need to limit greenhouse gas emissions. The theory overlooks the role of carbon dioxide and other greenhouse gases in actually helping nitrogen and oxygen molecules to shed their heat, and also their role in absorbing some of the infra-red radiation from the Sun. Note also that, if radiation were the main heat source for the lower troposphere, then it would cool off a long way below freezing point every night. In fact the air very close to the ground is warmed by conduction (sometimes called diffusion) to about the same temperature. Just go to Singapore where the maximum temperature is always about 31 to 32 degrees C every day of the year, whether cloudy or sunny. Even the sun near the Equator only causes 6 to 7 degrees variation between day and night. It is not carbon dioxide acting as "insulation" which is causing this small amount of daily warming. 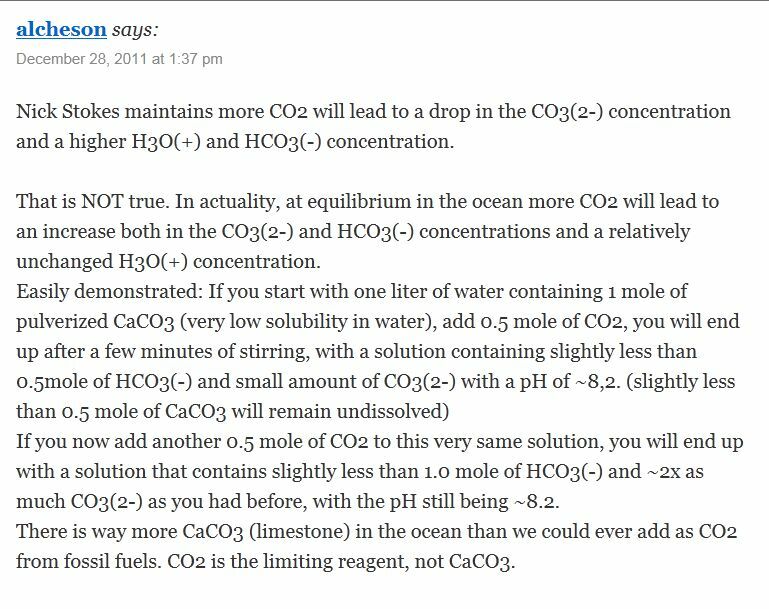 CO₂is nothing more than a small dam at the foot of a mountain which will never cause a flood at the top. The facts are that the rate of conduction under the surface and the rate of convection in the troposphere determine the observed equilibrium. Equatorial islands like Singapore have steady climates based primarily on the uniform temperatures underground and in the surrounding oceans - hail, rain or shine. If nearly all of the heat from the ground were radiated (as the IPCC assumed) then air temperatures would be all over the place (and far, far colder) simply because the amount of greenhouse gases (especially water vapour) varies dramatically. Ultra-violet radiation from incident solar insolation (UV-C) and captured IR radiation probably cause most of the daily warming above oceans. (Nearly all UV-A and UV-B is absorbed in the ozone layer.) Only when the sun warms land away from the oceans do we see additional warming in the surface, which then warms the air - partly by radiation and partly by diffusion leading to convection. Please click here to read my new site and click here to view my 2019 15-minute video. Click here for all 3 papers.